Doctors, lawyers, teachers and other professionals never stop learning new techniques and strategies to hone their craft and remain on the cutting edge in their field – and so, too, do tax practitioners. Joseph Malouf, The Tax Institute’s most mature graduate, is proof that you are never too old to learn. Joseph became the oldest graduate on 24 May 2018 at age 83 when he was awarded the Graduate Diploma of Applied Tax Law through The Tax Institute. Joseph’s eagerness to deepen his knowledge in the disciplines he is practising and hunger for acquiring new skills was the reason he started the Graduate Diploma. He was also encouraged by the Tax Practitioners Board to undertake refresher courses in commercial and taxation laws. When asked to share his advice to others considering study, Joseph’s first tip was to view study as a happy celebration, rather than as a heavy load. “Think of the study environment as a worthwhile place of enjoyment surpassing any other places,” he said. 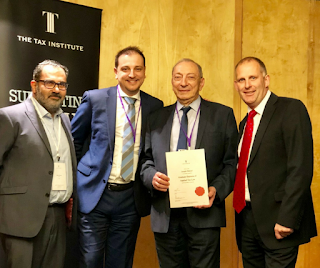 In addition to carrying out his clients’ work with a high degree of integrity, Joseph is continuing study with The Tax Institute and complete the CTA3 Advisory subject – the final step before achieving the prestigious, internationally recognised Chartered Tax Adviser (CTA) designation. Thinking about your or your team's tax study needs, or are interested in professional development? Find out more about what's on offer on our website or contact our advice team on 1300 829 338.